BUFFALO, N.Y. -- The Bisons couldn't complete a sweep of Scranton/Wilkes-Barre, falling to the RailRiders, 7-3, in front of a sun-splashed crowd of 10,516 at Coca-Cola Field on Thursday afternoon. With the result, the two teams concluded their 16-game season series with eight wins each. The Herd just couldn't get going after getting a first-inning run off RailRiders starter Adonis Rosa. The righty retired 15 of 17 at one point and allowed just one extra-base hit over his 6.1 innings of work. With Buffalo's attack at a standstill, Scranton/Wilkes-Barre powered ahead in the middle innings. Zach Zehner doubled home a run in the fourth and Mike Ford came through with a two-out, two-run single as part of a three-run RailRider fifth. 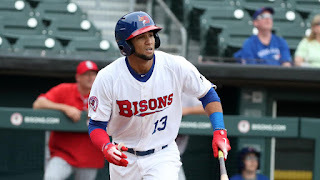 The opponents then plated three more hits in the sixth thanks to a couple of Herd fielding errors and an RBI-single from former Bisons backstop, Wilkin Castillo. The Bisons had a great chance to get back in the game in the eighth inning off the RailRiders bullpen. The first four batters of the frame reached base with Lourdes Gurriel Jr. drawing a five-pitch walk to force in Anthony Alford. Two batters later, catcher Alberto Mineo singled home Dwight Smith Jr. with his first career Triple-A knock, a sharp single into right field. With the bases still loaded and a six-run cushion down to four, Scranton/Wilkes-Barre brought in righty Joe Harvey, who struck out Gunnar Heidt and Michael De La Cruz to end the threat. Gurriel Jr. drove in the team's first run with a line drive single into left in the first inning. He finished the game 2-4 with an RBI, his second straight multi-hit performance. The Blue Jays infielder is now hitting .417 (5-12) on his MLB injury rehab assignment with the Bisons. The loss for Buffalo went to Jacob Waguespack, who is now 5-7 in his combined season between the Herd and the Lehigh Valley IronPigs. He allowed four runs on seven hits in five innings of work. The Bisons now have just four home games left during the 2018 season. The final Honda fridanynightbash! of the year is next with the Pawtucket Red Sox coming to town. CLICK HERE to get your tickets today.